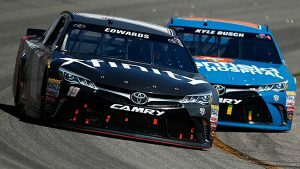 Just a little bump and grind, well that’s why R Kelly said, today it’s what Kyle Busch gave to Carl Edwards in the Toyota Owners 400 at Richmond International Raceway. A caution flag reset the field with 36 laps to go at the 0.75-mile track as Kyle Busch and teammate Edwards, who led a race-high 151 laps, led the field to green. As the leaders hit lapped traffic with 14 laps to go, Edwards and Jimmie Johnson were able to close Busch’s lead. Edwards had the faster car but waited until the final turn to bump Busch out of the lead and take the victory. For Edwards it was a weekend sweep at the track where he has excelled in the past, but never ever to capture back to back races in one weekend. “I just have to give it up to my teams for the weekend. They had both of the cars running extremely well. That bump, well you know how it goes here at Richmond, said Edwards.